Never run out of camping food ideas. The Wolf’em Stick has mastered all your campfire classics, and is especially skilled in its biscuit-cup-making technique. Enjoy doughy, delicious treats you can roast over a campfire then fill with whatever you like—from fresh fruit to pudding . . . even savory soups. Aside from its wooden biscuit mold, there is an additional attachment for dogs and ‘mallows. You’ll wolf ‘em no matter the recipe you pick. Dimensions: 33.5" x 3.5" x 1"
I love the biscuit roaster! This is a great invention by 2 teens! It's a great deal- 2 ends for 1 handle. It took way longer than I thought to cook the dough the whole way through. Making one for each of the kids (3), they lost interest. Unique but not practical. It does take 3-5 minutes to bake a Wolf’em cup over the fire. If it’s taking longer than this, you may be using more dough than is necessary. The cooking head on the Wolf’em stick has been sized to work perfectly with a single piece of regular size refrigerated biscuit dough. If you’re using large or “grand” size biscuit dough pieces, they will need to be cut in half to be the right size to bake through properly. - Have one Wolf’em stick for every two people. This makes it so everyone is always either making or eating a Wolf’em. 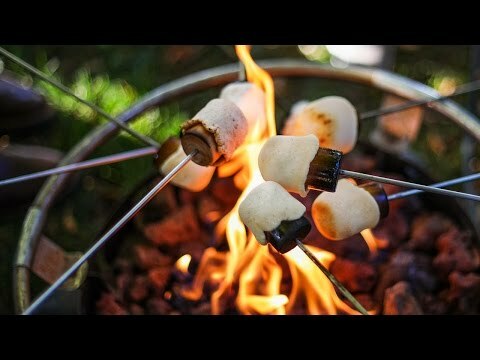 When it comes to campfire treats, this nifty tool makes it easy to prep ‘em, roast ‘em, wolf ‘em . . . then repeat.